Recently I posted a blog on some really emotive images from around the world. Click here to see them. I love photography and I love its ability to capture the moment. 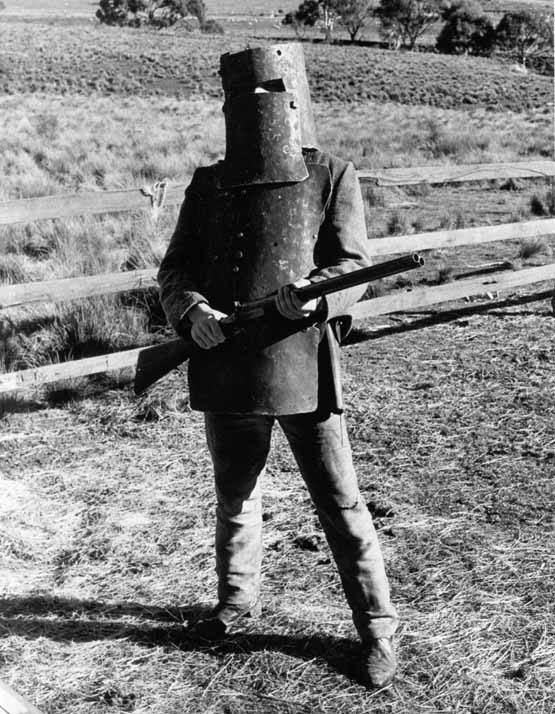 So I thought I would search out for some emotive Australian Images. I hope you enjoy my collection. 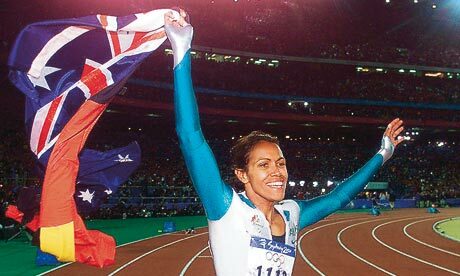 Cathy Freeman after winning the 400 metre race at the Sydney Olympics. 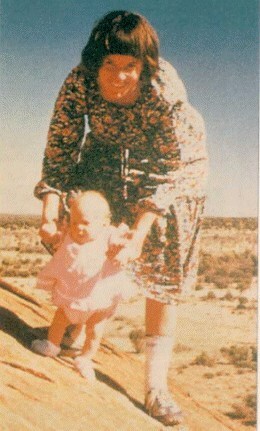 Lindy Chamberlain with baby Azaria – who disappeared on the 17th August 1980 – whilst camping near Ayers Rock. The Great Sir Don Bradman. 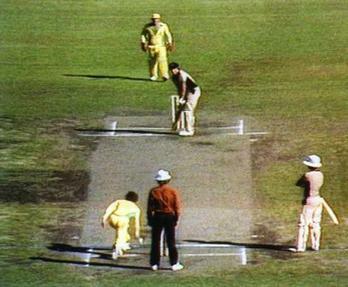 Australia’s greatest cricketer ever. 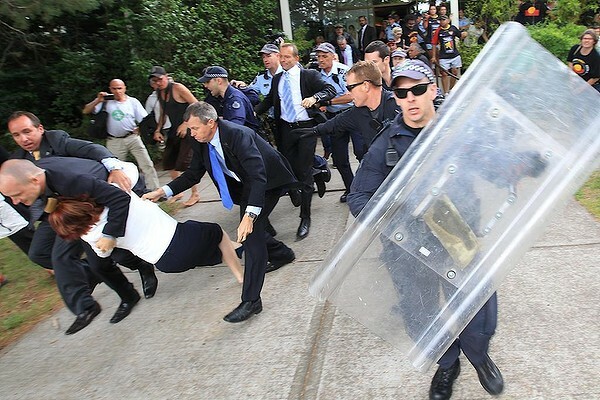 Australia Day 2012 – Prime Minister Gillard being whisked away by her security detail after protesters stormed the venue where she was. 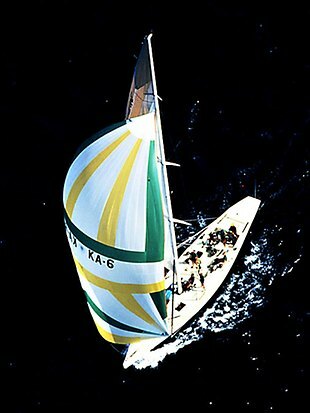 Australia II, captained by John Bertrand, won the 1983 America’s Cup – the first country to win the cup in 130 years. A photo of young Aboriginal Children who were taken from their parents and raised in Anglo-Saxon homes, in what has become known as the Stolen Generation. National Sorry Day in Australia. The famous speech on the steps of Parliament House by Gough Whitlam after his Government had just been sacked by the Governor General, Sir John Kerr in 1977. 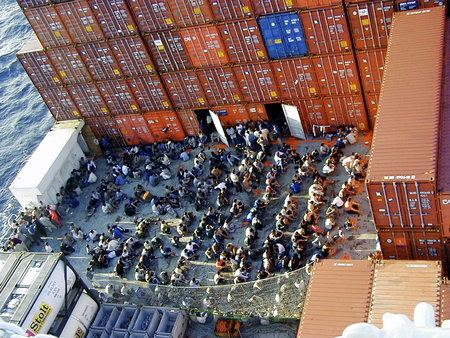 Asylum Seekers rescued by the Tampa Cargo Ship in August 2001 – it changed the course of the Federal Election. Born in NZ but claimed as an Australian Horse – one of the most successful racehorses of all time – Phar Lap. This photo was taken in 1929. 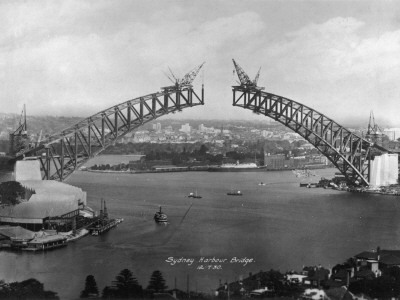 Construction of the Sydney Harbour Bridge. Granville Rail Disaster on the 18th January 1977 – 83 people were killed and more that 210 were injured. Bali Bombings in 2002 where 188 Australians were killed. 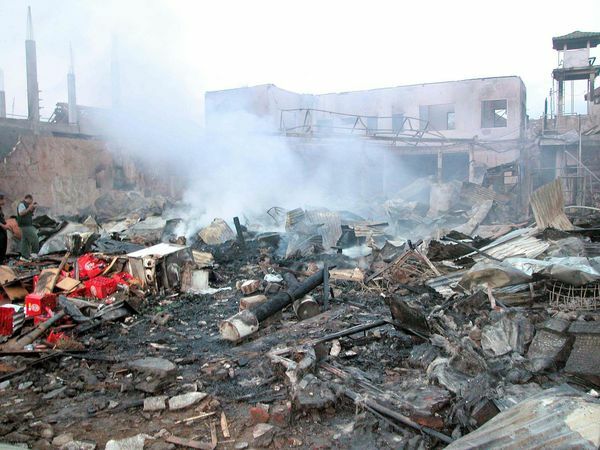 Black Saturday in 2009 in Victoria where 343 people were killed and over 2000 homes destroyed. Cyclone Tracy – 1974 in Darwin. An Australian woman cries after she miscarriages. 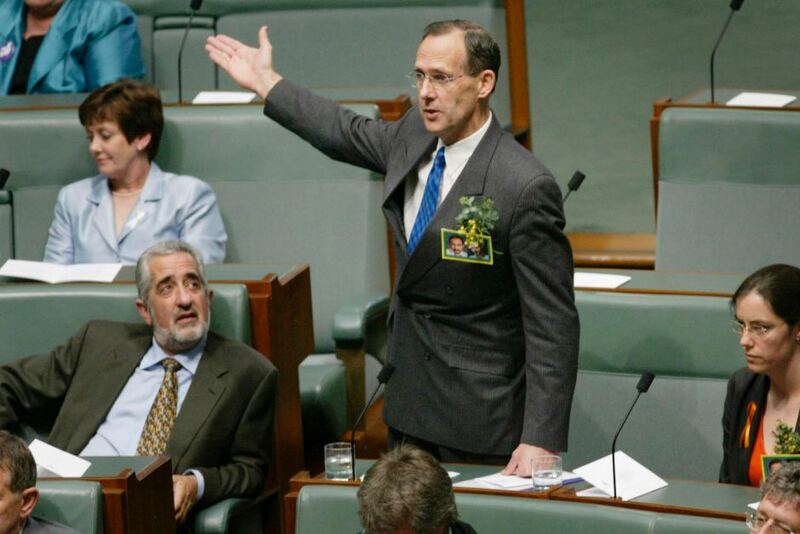 Senator Bob Brown interjects during a speech to the joint houses of the Australian Parliament by US President George Bush. He then got kicked out. 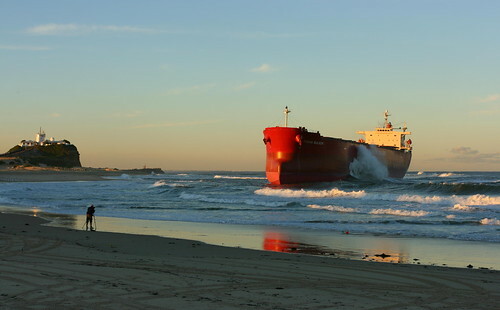 Cronulla riots on December 17 2005. Image from the 1963 Grand Final where Wests lost to St George. This image was immortalised as the figures on the NRL Trophy. The two men in the photo are Norm Provan and Arthur Summons. 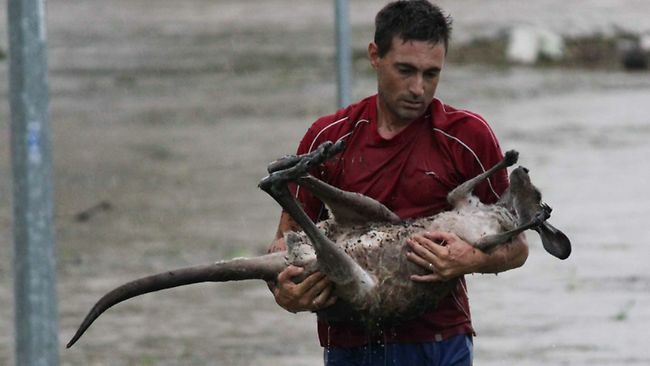 Ray Cole carries a Kangaroo to safety during the 2011 Queensland floods. 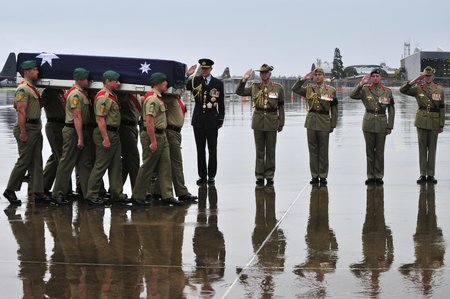 Ramp Ceremony for an Australian Soldier killed in Active Duty. 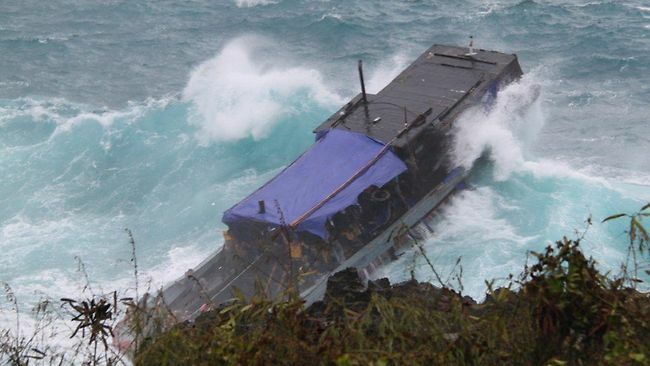 An Asylum seeker boat minutes before it smashed into Christmas Island, causing the death of over 50 people. Photo from the 80’s that caused a huge stir in Britain when the PM Paul Keating put his arm around the Queen – earning him the title The Lizard of Oz. Kempsey Bush crash in 1989 killing 35 people. Princess Diana, Prince Charles and Prince William in Australia. If this Blog has been helpful or inspiring to you, please feel free to share it on Facebook or Twitter. Email Subscriptions to my blog are welcome or you can contact me through Facebook (facebook.com/peterpilt) or Twitter (@PeterPilt). Have a great day. Peter Pilt’s Top 19 Classic Songs About Australia or Our Way of Life. ‹ 35 Powerful Emotive Images that Capture a Moment. 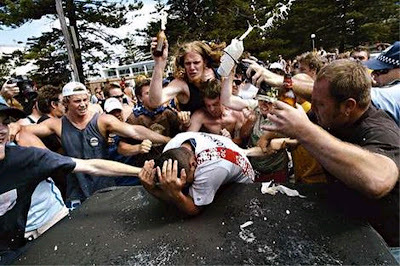 A correction that I’m embarrassed to have to point out – the “Coogee riots on December 17 2005” were actually the Cronulla riots. As a local, it’s a shameful thing to have to admit to. The blog not your shame. 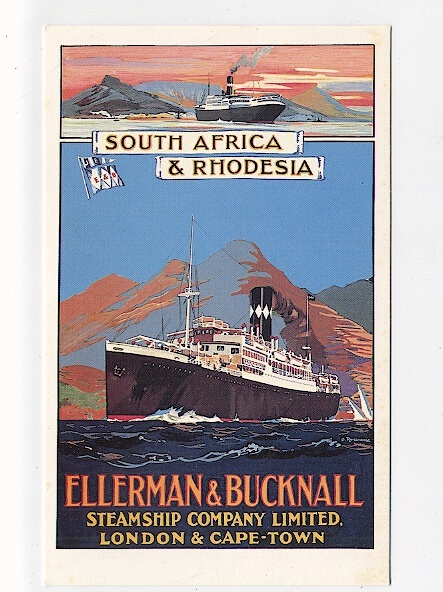 The pasha bulker remember that well according to Wikipedia the word pasha entered English from the Turkish word pasa is from the ottomon empire and corresponds with the british title Lord and is one of the highest held titles in pre-republican Egypt. 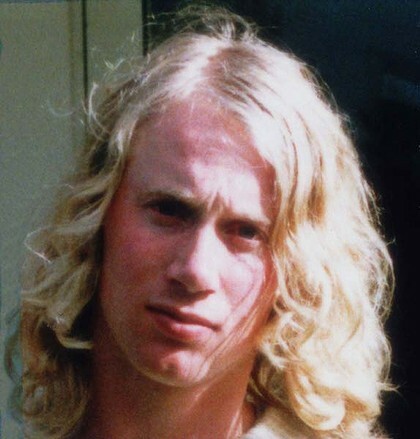 Where is Martin Bryant now still in prison? Edward Kelly you’ve been listening to too much Steve Grace. The joker ooooh that’s almost as bad as that burnt out old car (i’ve heard preachers talk about burnout but that’st he worst case i ever did see) at least it was the Roxy and not the Regent…. I do think differently don’t i ignore it. Overall am enjoying looking at your photos how do you find the time as a pastor to source them all is what i’d like to know. Very moving. I go for Eternity on the Harbour Bridge – 1/1/2000 – a global proclamation, at last!